We are a dog friendly pub in central London, with treats, dog bowls, and food and drinks for owners! We have an outdoor terrace and cozy indoor space! Friendly Gastropub with dogs welcome on the ground floor. Treats, snacks and drinks for owners and pups available, plus you might get to meet Morgan, the landlady’s personal pooch! The Village is set right in the heart of Walthamstow Village E17. We accept dogs on a lead at all times and will always offer a bowl of water! 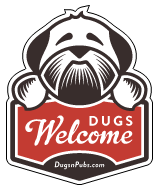 There are a total of 320 dog friendly listings in the London Pubs category. Please log in, or sign up as a member to view all listings.